Apple is said to unveil three iPhone variants this year, and leaks point at a budget 6.1-inch device with no OLED display and no 3D Touch. Another variant is expected to be the iPhone X successor with an OLED display, and the most premium will be the Plus variant with a 6.5-inch OLED display. 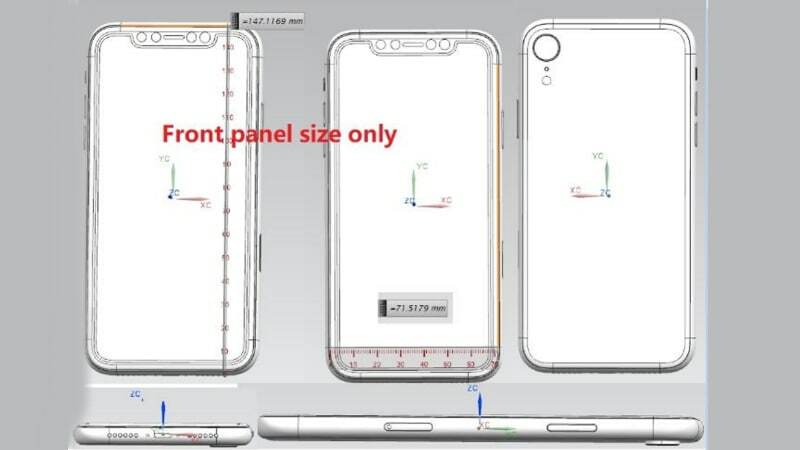 Now, schematics of the budgeted 6.1-inch and the most premium 6.5-inch iPhone have been leaked. These schematics give us dimensions, and they also reveal some key new features that the tech giant is thinking of introducing this year. These schematics were published by Forbes, and possibly the biggest news is that it shows the 6.5-inch iPhone X Plus with a triple lens camera at the back. All the three sensors are placed vertically, and this could mean some seriously good photos from the largest variant. Apple could go the Huawei P20 Proway with a primary, telephoto, and a monochrome lens at the back. However, the schematic leak could be wrong, and Apple may just stick to two lenses with one flash module in the middle. The report states that the 5.8-inch iPhone X successor will have two vertically stacked camera at the back, just like last year, and if Apple is to bring triple lenses, it will only be on the most premium Plus variant. According to the report, the 6.5-inch iPhone X Plus will have dimensions at 157.2 x 77.1 mm. This is a bit smaller than the 5.5-inch iPhone 8 Plus which had a footprint of 158.4 x 78.1mm. Coming to the budget 6.1-inch iPhone, the schematics measure at 147.12×71.52mm. This is similar to the current 5.8-inch iPhone X which measures 143.6×70.9mm. The leak shows a single rear camera at the back, and a more pronounced notch than the other Plus variant. The report also states that the budgeted device will have the first generation Face ID, while the 5.8-inch and 6.5-inch iPhones will have second generation Face ID support. Top Apple analyst Ming-Chi Kuo – currently with TF International Securities – said recently that Apple might cut prices of new iPhone models to debut later this year by as much as $300 (roughly Rs. 20,300). It is expected that the 6.1-inch LCD iPhone model will be priced between $600 (roughly Rs. 40,300) to $700 (roughly Rs.47,000), the 5.8-inch OLED iPhone will cost between $800 (roughly Rs. 53,700) and $900 (roughly Rs. 60,400), and the 6.5-inch OLED iPhone X Plus will be priced between $900 (roughly Rs. 60,400) to $1,000 (roughly Rs. 67,100). Apple may adopt such an aggressive policy because of improvements in production yield and reduced prices of components. Also, Kuo claims that Apple is concerned over ‘the negative impact of a higher price’ in the already nearing saturation smartphone market. Additionally, the 2018 models are expected to sport bigger batteries this time, come with USB-C fast charging accessories, and perhaps the biggest news of all, support dual-SIM functionality.